Our range of products include kazak rugs, 100% pure wool kazak rugs & carpets, hand knotted modern style kazak wool rug, new design kazak handmade rug, 100% pure wool kazak area rug for living room and beautiful royal hand-knotted red color kazak wool carpet. 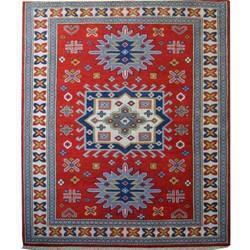 With the help of our professionals, we are engaged in offering a wide array of Kazak Rugs. Our given kazak rugs are designed by our professionals keep in mind the current market trends using excellent quality material. Our entire range of kazak rugs is gaining appreciation for their unmatched quality and appealing look. 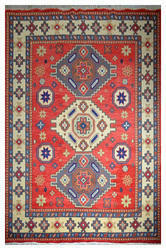 Furthermore, we provide these kazak rugs in various colors and designs to cater the wide needs of customers. 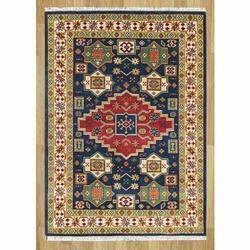 With the help of our professionals, we are engaged in offering a wide array of Kazak Rugs. Our given Kazak rugs are designed by our professionals to keep in mind the current market trends using the excellent quality material. Our entire range of Kazak rugs is gaining an appreciation for their unmatched quality and appealing look. 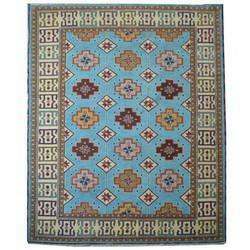 Furthermore, we provide these Kazak rugs in various colors and designs to cater the wide needs of customers. 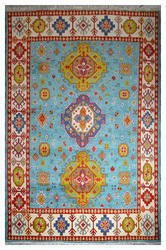 This is a top quality hand-knotted Kazak rug that has natural wool and natural dyes (from plants and roots). This Kazak carpet has a very soft wool. 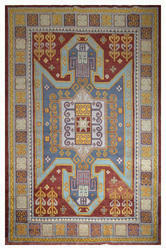 It is known as a Kazak rug as it has a traditional Russian pattern from Caucasian (Kazak) areas. Kazak rugs are suitable to use on the floor and are known for their long lasting duration. This carpet is woven in India. The patterns are inspired by Russian geometric patterns and the wool used is made from natural vegetable dyes. The carpet is durable with powerful colors. They are stone washed giving it a glossy look. The strong Persian influence is immediately recognizable in this superb hand knotted rug. Bold geometric designs with spacious patterns and colors of the older Kazak rugs. These stunning area rugs are complimented by a versatile palette of strong hues and rich tones that blend traditional and modern elements to embody elegance and sophistication. Today, newer carpets are produced in India with inspiration from the Caucasian carpets which are colored with natural plant dyes. 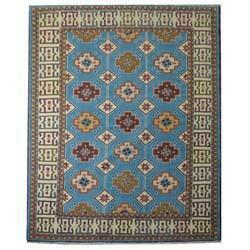 These carpets are durable and have a relatively short pile and are sold under the name "Kazak". Genuine Kazak Carpet This is a top quality hand-knotted Kazak rug that has natural wool and natural dyes (from plants and roots). This Kazak carpet has a very soft wool. 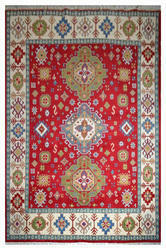 It is known as a Kazak rug as it has a traditional Russian pattern from Caucasian (Kazak) areas. Kazak rugs are suitable to use on the floor and are known for their long lasting duration. Genuine Kazak CarpetThis is a top quality hand-knotted Kazak rug that has natural wool and natural dyes (from plants and roots). This Kazak carpet has a very soft wool. 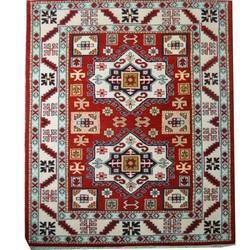 It is known as a Kazak rug as it has a traditional Russian pattern from Caucasian (Kazak) areas. Kazak rugs are suitable to use on the floor and are known for their long lasting duration.